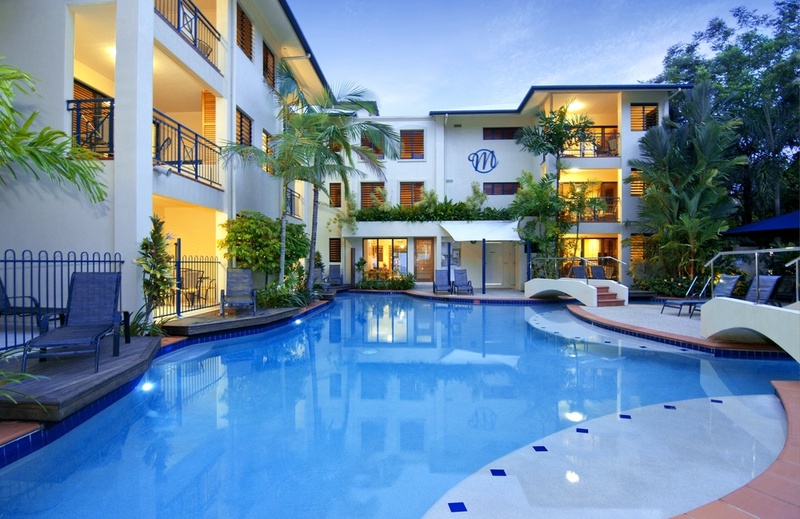 The Meridian at Port Douglas is a contemporary boutique resort offering luxury apartments for couples in a selection of self-catered studios and one-bedroom apartments. Ideal for couples requiring a peaceful and relaxing getaway. (Please note that children under 15 years are not catered for). The central feature is the heated lagoon style pool, with pool decks extending from the superior apartments and studios. There is also an outdoor BBQ entertaining area and an eight-person Jacuzzi/spa set amongst the tropical gardens. Superior ground level apartments have the facility of direct access to the temperature-controlled heated swimming pool from private timber decks, while superior higher level apartments have Jacuzzis / hot tubs on spacious balconies. Superior studios have direct pool access to the heated lagoon style pool or have a Jacuzzi in a private courtyard. Honeymoon suites all feature private heated Jacuzzis / hot tubs -- or you can indulge in one of our deluxe honeymoon suites that feature a heated Jacuzzi in the private courtyard and also direct pool access via a private pool deck. The Meridian at Port Douglas is perfectly located within walking distance of all the important amenities and local landmarks: the breathtaking Four Mile Beach is only 200 metres, the cosmopolitan restaurant strip on Macrossan Street is only 100 metres, and the Marina, where the cruises depart for the Great Barrier Reef, is only 400 metres.